As millions were awakening from turkey-induced comas and gearing up for Cyber Monday, Steam was busy catering to a belt-busting number of gamers. The Valve-owned property hit a new concurrent use record Sunday, topping out at 7,190,572 gamers online at the same time. This scorches its 2012 record of six million-plus concurrent users and follows Valve's October brag that Steam pocketed 65 million actives. Chances are the long US holiday weekend in conjunction with a doozy of an Autumn Sale helped Steam topple the old consurrent use high-mark, but what does this mean for the platform moving forward? 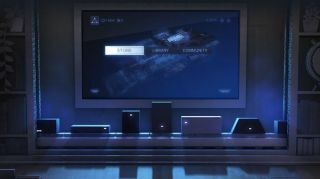 Valve is readying its own Steam Machine console along with offerings from partners (all due for CES 2014 showings), plus preparing the SteamOS platform for public consumption. Sunday's record is a feather-in-the-cap achievement for PC gaming, but chances are we're in for even higher user figures once Valve's next-gen projects start boiling. Steam Machines may not be ready until 2014, but our blips are right here, right now.